There are many hairstyles you can combine with a long skirt. From open side parted hair dos to nonchalant hair buns you can find something that suits you. Below we’ll take a look at how some of our Bollywood divas pull it off. Hopefully that will serve as a source for inspiration for you. 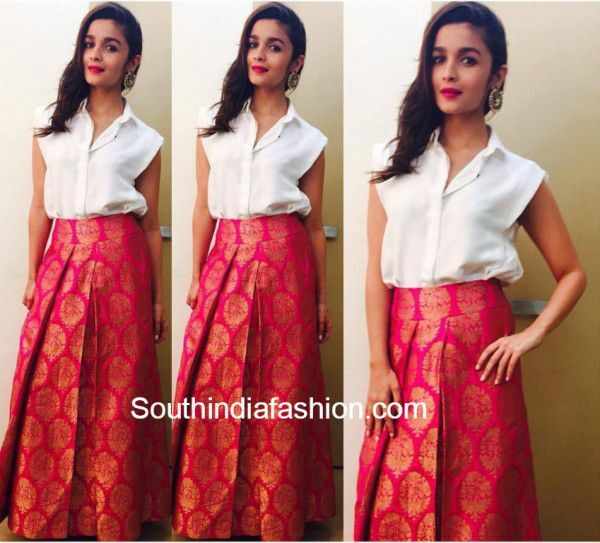 Alia Bhatt often wears long skirts and knows how to combine them with some super trendy hairstyles. This side parted wavy affair looks suave and chic. If you are looking for an ethnic summer look then this open hairstyles and long skirt combo will look great! This pleated skirt is begging to be combing with an open hairstyle. Katrina is the queen of seductive hairstyles and this open layered hairstyle is no exception. If you like you can also consider adding highlights to your hair for more texture. Jacqueline Fernandes looks super casual and chic in this simple half updo. You can use a simple butterfly clip or if you want to go a little retro you can use a banana clip and travel back to the 80s. This long skirt hairstyle looks splendid on Priyanka. The side bun adds a touch of elegance and the puffed front bangs give the hairstyle that glamorous look and feel. Sonam Kapoor looks too cute in this simple ethnic long skirt and twisted hairstyle. The hairstyle is a simple variation of a high ponytail. The twist and puff reflect Sonam’s playful attitude to hairstyling. Tamanna looks supremely beautiful in this curly open hairstyle and long skirt. The deep red color of her hair matches the pleated red skirt and ethnic top perfectly. Kangana Ranaut it one the most stylish Bollywood actresses when it comes to hairstyling. Kareena looks stunning in this simple side braid and long skirt! Priyanka looks gorgeous in this simple ponytail and puff combined with a beautiful maxi dress. This simple high ponytail is playful and sassy and matches the pleated long skirt. Samantha shows us how to be chic with a low hair bun and long ethnic skirt. Alia looks too cute with the braid and skirt and top suit. Anushka goes rustic elegant with this simple low hair bun and flower patterned long skirt. Many hairstyles go extremely well with long skirts. Side braids, side buns, intricate ponytails or plan open hairstyles are all options you could go for. Hopefully you have identified a style that suits the particular skirt you are wearing. You might also want to check out our post on gown hairstyles. Happy hairstyling from Hairstyle Monkey!